IN APRIL, SHORTLY AFTER the launch of the latest 'Three', changes to the company car Benefit-in-Kind emissions-based rates did the 3 Series no favours  the main-selling 320d was slapped hard with a 5% increase that moved its BIK rate from 13% to 18%. However, BMW already had a tax-beating version of the 320d  the 320d ED (EfficientDynamics)  in the pipeline. Available now, it is the most efficient executive car on sale with a CO2 output of just 109g/km. This ED version rates 15% for company car tax purposes, plus businesses can write-down 100% of its cost in the first year of ownership. The 161bhp 320 ED model with a six-speed manual 'box is priced at �,080  the same figure as the best-selling 181bhp 320d SE on which it's based. Both versions offer the option of an automatic transmission and although this adds �525 to the price, it doesn't have any adverse affect on performance, fuel economy or emissions over ED manual models. All customers, both private retail and business users, will also benefit from the 320d ED's lower road tax  �for the first year and then only � per annum for the second year of ownership onwards (the standard 320d with 120g/km also has a �first year rate then � per annum after that. Okay, it's only a tenner saving but then every little bit helps. An even larger saving is to be had by the improved fuel economy: officially for the Combined Cycle the 3 Series ED saloon returns 68.9mpg against 61.4mpg for the standard 320d. Now we all know that official mpg figures rarely match actual on-road driving but my test 320d ED with a manual gearbox returned a fantastic 66mpg average over a week's driving covering more than 800 miles! This included over 500 miles on motorways at the usual 70-80mph cruising speeds, slower runs on winding A/B roads, queuing to get in and out of the Goodwood Festival of Speed event along with local trips to the shops. Don't forget that this is a premium brand, high-performance executive four-door saloon I'm talking about here so it rather makes the case for electric and hybrid cars of this size seem a lost cause. My driving was undertaken just using the ED model's gearchange driving prompts, which generally mean short shifting between the gears. I would emphasise that this was no 'carpet slipper' economy driving exercise; just normal motoring, normal accelerator pedal pressure and changing gear as indicated. During my test the Ed's Drive Performance Control was left in Eco-Pro mode, which harmonises various engine, steering, suspension and power demand functions as needed. Although the power of the 2.0-litre, four-cylinder twin-turbo diesel ED engine has, compared to the standard 320d, been dropped by 20bhp as part of the EfficientDynamics tweaks, its torque remains the same  280lb ft  so in spite of the taller gearing the driver isn't continually changing down through the gears to keep the car moving in the normal zippy BMW manner. Top speed is 143mph with zero to 62mph taking 8 seconds. In top gear at just 2,000rpm the car cruises happily at 80mph; just 1,500rpm returns a carefree cruising speed of 60mph  no wonder it's so fuel-frugal. All BMW cars, not just this model, have BMW's award-winning EfficientDynamics construction and power saving technologies. The confusingly-named 320d ED variant has added additional tweaks such as auto stop-start, brake energy regeneration, Drive Performance Control, gear change indicator, electronic power steering, lighter components, reduced rolling resistance tyres and lowered suspension for improved aerodynamics. Talking of EfficientDynamics, news just in is that additions to the new 3 Series line-up due later this year include hybrid, 4x4 and M Sport variants. Petrol engine enthusiasts haven't been overlooked either  a 320i EfficientDynamics model also comes to the range priced at �,370 making it considerably cheaper to buy than the diesel version: it has a 168bhp 1.6-litre twin-turboed powerplant generating 184lb ft of torque and returns 53.3mpg. CO2 emissions are 124g/km so BIK is a low 15% with �first year road tax and �0 for the second year onwards. So BMW customers will soon will be able to choose between diesel and petrol 3 Series models all with EfficientDynamics spec. Back to my diesel-drinking test 320d ED... in all respects this model drives just like a normal 3 Series rear-wheel drive saloon  it serves up agile handling and sharp steering (note that fitted with 16-inch wheels without run-flat tyres, the ride was more comfortable and the handling less fidgety over poorer roads surfaces). The specification is based on the best-selling ES trim and equipment level so includes all the usual items such as power windows and door mirrors, AirCon, Bluetooth, iDrive infotainment, alarm, cruise control, rear parking sensors, automatic lights and wipers and a decent sound system. 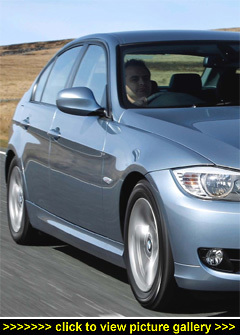 Reasons to go 'EfficientDynamics' include the significant tax advantages for company car users, fuel savings for both private and company drivers, an auto gearbox option that doesn't alter CO2 emissions, a comfortable ride, high-quality interior  and it's the same price as a standard 320d. Against? It's very rare that I can say this, but Nothing!